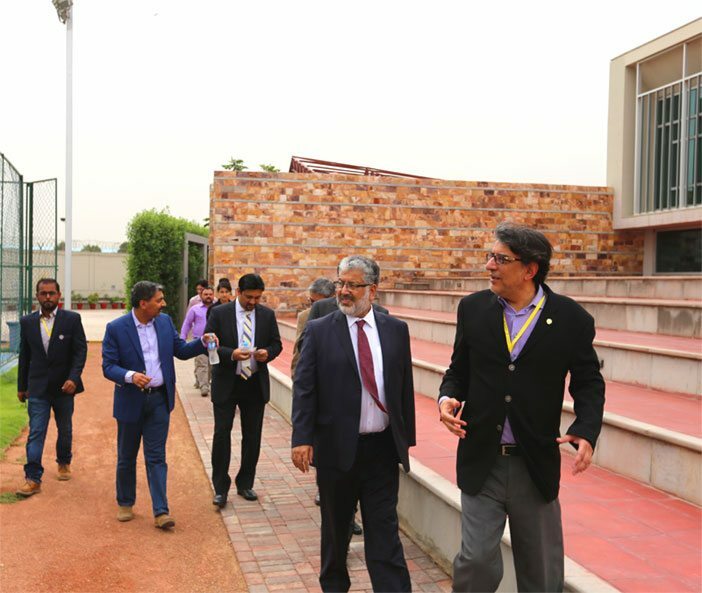 On August 29, 2017, the Higher Education Commission (HEC) Chairman, Dr. Mukhtar Ahmed, along with Samir Mir Shaikh (Pakistan Chairman Higher Education, Science & Technology FPCCI) and Javed Memon (Director HEC Sindh), visited Habib University for a campus visit. 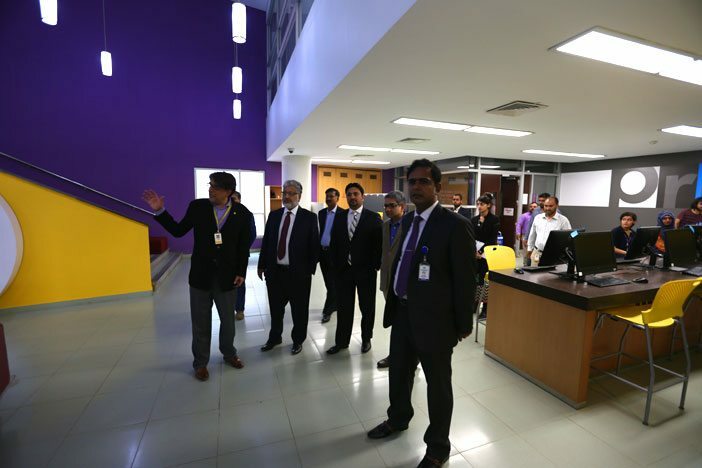 The campus tour was led by Mr. Wasif Rizvi, President of HU, where the Chairman was shown the state of the art campus and facilities accessible to students. Mr. Rizvi also gave a thorough run through of Habib University’s vision and mission. Mr. Rizvi shed light upon the ethos and logos of Habib University. He surfaced the multidimensional concept of YOHSIN; that encompasses five major paradigms. These paradigms strive for ‘Excellence’, nurturing ‘Passion’, learning to ‘Respect’ others and sparking the desire to ‘Serve’ the communities that are inhabited. Following the tour, Dr. Ahmed was introduced to senior management and faculty members residing on the Academic Leadership division, prior to a presentation and subsequent discussion. Mr. Rizvi presented the current problem with higher education in Pakistan today and how Habib University is trying to tackle the issue by having introduced a liberal arts method of education. He addressed the issue of equal opportunity in higher education not just in terms of examination boards, but in terms of gender. At present, Habib University boasts a 53% enrolment of female students in the Class of 2021, with a record 31% of female students in the School of Science & Engineering. Of the overall Class, 25% of the enrolment of students is from local examination boards. His presentation dealt with the issue of the continuous development of Pakistan at the grass roots and ensuring educational institutions are able to generate effective leaders of tomorrow. The President of HU went on to explain Habib University’s mission to provide all students with equal opportunities and went on to explain the HU Talent, Outreach, Promotion, and Support (TOPS) program which HU launched to encourage students to apply from the local examination boards. The summer program provided students with additional support in core skills in English and Mathematics. The preparatory classes also aimed to teach students how to handle the HU Entrance Examination and familiarize themselves with the online entrance examination system. Mr. Rizvi highlighted the fact that this program was initiated as universities across the country pay close attention to students from Cambridge examination boards, steering further away from local examination boards. The Chairman was pleased to hear about the program and especially that this Fall, HU admitted 25% of its students from local Pakistani examination boards, boasting an all-inclusive student body. The HEC Chairman was further briefed on the need-blind policy implemented by the University which secures admission for intellectually sound and deserving students without discriminating against socio-economic background, gender, or those who may not be able to financially support themselves. 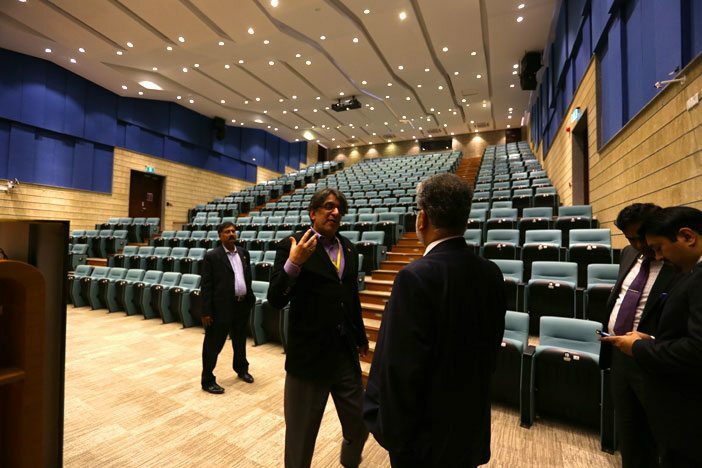 The Chairman was positive about the impact Habib University would have on Pakistan, stating “I’ve heard a lot about Habib University and it is a good institution, especially for the ongoing affairs in the country”. Dr. Ahmed was keen on being a facilitator for the University, aiding with services or courses the University wished to add to its already prevalent mix. He wished to share President Rizvi’s presentation with the HEC Vice Counsel to indicate missing factors in the higher education system in Pakistan – which HU is addressing. The HEC agreed to provide an ongoing learning platform for universities to communicate and collaborate on projects such as reviewing courses, working on curriculums; and student and faculty exchange programs across Pakistan. On an end note, Dr. Ahmed was keen on staying connected with the Habib University management whether it was in person or via video conferences. The event took a step in a positive direction, opening the doors for more successful learning and research opportunities for the University.